Let’s start with the universally accepted principle that configurability, like the rest of the “abilities” relative to HCM systems — usability, scalability and inter-operability — are the hardest aspects of a product offering to dramatically improve. These platform attributes (vs. features) consequently should be front and center when evaluating prospective HR technology, because if high marks aren’t earned now, that likely won’t be changing anytime soon. Conversely, “features” are basically being added every product release cycle, which are occurring much more frequently in the cloud HCM era. This post looks at the various strategic components of an HCM platform from the standpoint of where very robust configurability — or the ability to determine how the system behaves based on user defined rules, parameters and other conditions – matters most. And this control over the system, whether related to defining workflows, process or data handling rules for different populations, or other process nuances, should largely be within the purview of the HR or HRIS organization … with the exception of the most complex configurations. My perspective on where configurability matters most is based on operating for three decades on all sides of the HR and HR Technology domain. Additionally, a key point to highlight up-front is that while HR technology process areas are arranged below according to where a configurability toolset is most critical (listed from least to most), all strategic HCM areas or more transactional / administrative HR areas have configurability-related requirements. This discussion is therefore about relative importance of the configurability toolset, not where it is or is not important. Learning Management: Examples of areas often associated with configurability requirements and capabilities include branding, workflows (e.g., requests and approvals), courses offered by learner profile or organizational criteria, curricula or course-chaining rules, eligibility drivers, test results as drivers, e-Commerce rules (to charge-back the learner’s cost center), assessment steps and options, gamification parameters, governance rules around social learning and 3rd party content, etc. Learning management systems absolutely need to be configured, and arguably as much as any other strategic component of an HCM system in order to drive ROI. The reason why I started off mentioning LMS tools is because configurability rules tend to be relatively straightforward and standard from customer to customer; consequently the flexibility and sophistication of these capabilities probably won’t be a major source of product differentiation. Total Compensation Management: Examples include eligibility to participate (i.e., be covered within) a particular compensation process, salary increase rules and guidelines (aka “grids”), total compensation elements and parameters, total rewards statement options, long-term incentive plan and deferred compensation plan parameters, and something we will see more of going forward given the importance of personalization in achieving a superior employee experience: total compensation trade-offs and equivalencies; e.g., ability to “trade” X portion of an annual salary increase for a type of compensation with more upside but also greater risk. 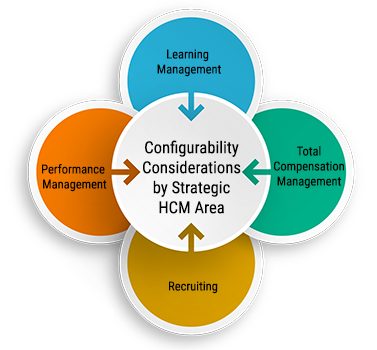 This area of HCM is being mentioned second because while configuration needs such as specifying increase guidelines and eligibility rules largely have common structures across companies, long term incentive data handling rules and plan designs can vary significantly. Recruiting: Examples of process aspects that can have very broad and/or complicated configurability requirements — thus making the configurability toolset’s sophistication and flexibility more of a product differentiator — include branding the candidate experience, job posting rules, a myriad of rules for automating candidate relationship management and recruitment marketing activities, interview sequencing parameters, when different screening steps apply, offer letter content scenarios, background checking steps, assessment test applicability and access to results, when search firms and agencies can be used, workflows related to starting salary and what data gets passed to the employee record. Given all the different flavors of recruiting-related configurability needs, does another talent management automation area exist where the criticality of configuration capabilities is on-par (or sometimes even more critical) than recruiting? Yes. Performance Management: Recruiting and performance management are fairly close as far as being HCM areas where a flexible and powerful (but also straightforward to use) configurability toolset is a huge difference-maker. The key reason why I’m asserting that performance management is the HCM process or system component where these capabilities matter the most is the following: Organizations often use more than one system for talent acquisition, so all of the impactful configuration capabilities don’t have to be provided in one product. Performance management on the other hand, including in the context of modern day continuous performance management (“CPM”) and real-time coaching, is almost always handled through just one product’s configuration capabilities; therefore, the performance management product used must have a configurability toolset that is frankly off the charts. A sampling of such capabilities include aspects related to process design (e.g., 360 degree feedback or something else; as well as whether the process is goal or competency-centric or both), the process per each population segment or business area, weightings for goals and/or competencies, capturing coaching content and actions needed/taken, participation parameters, whether other “employee value indicators” are captured in the process (e.g., employee mentors others even though it’s not part of their job purview), how data is passed to other systems such as learning management, how kudos or other types of recognition are given, etc. And if an end- customer decides they want to capture something a bit more esoteric such as which competencies might become increasingly important or the opposite? Well this is where the PM tool’s flexibility and power are also on display. If you’re in the market for enterprise performance management software that excels and differentiates by allowing users, including non-technical users, to shape and mold the system any way they need to, now and in the future, you should focus on configurability capabilities. The more impressive these are, the longer you will use the product when your industry counterparts are in replacing mode, and the shorter your time-to-value will be.